Strong Lloyd’s Managing Agency requires a Deputy Actuary to join a dynamic and growing team which will offer all aspects of actuarial support to the business. As the Deputy Actuary you will be more likely focused on pricing, however you must be able to demonstrate strong skills and experience in either reserving or capital from previous experience. 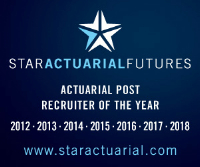 Reporting to the Chief Actuary, you will be one of the founding members of the team, helping to implement the key building blocks for a truly integrated actuarial division. Newly qualified or approaching Fellowship and current experience in the Lloyd’s or London Market. Please do call me to discuss further – this is a great opportunity.